Replace propane with high pressure natural gas right from your standard utility natural gas pipeline! 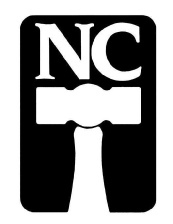 Hi-pressure natural gas is the right fuel for your forge ! Best of all, for equal heat performance natural gas costs a lot less than propane. If you pay $ 75 for a 100# propane tank it would cost less than $ 20 to get the same heat with natural gas! 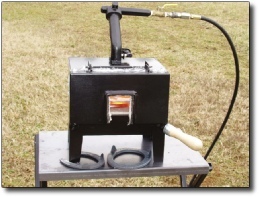 Each burner on an NC Tool forge can use between 29-47 cubic feet of natural gas per hour depending on the pressure setting. Use this chart to determine your gas flow requirement. Multiply the gas consumption per burner times the number of burners on your forge to determine total gas flow demand. 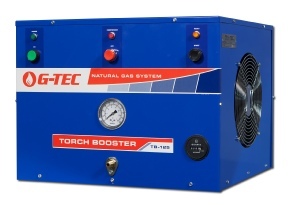 Many G-TEC customers report good performance with their NC Tool Forge with 8 psi gas supply pressure at the forge and the following Torch Booster recommendations are based on 8 psi gas supply from the Booster to the forge . Contact G-TEC at 800-451-8294 to discuss the right Torch Booster if you plan supply pressure greater than 8 psi to your forge. TB-30 Torch Booster for single burner forges. TB-30 Boosts gas pressure as high as 25 psi with a flow rate of 40 cubic feet per hour. It runs on standard 120V 15 amp power and connects to a 1/2” diameter low pressure gas pipe. Learn more about TB-30 Torch Booster. Purchase a TB-30 Torch Booster. TB-60 Torch Booster for two burner forges. 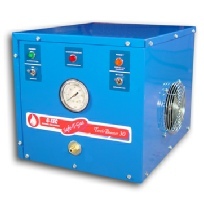 TB-60 Boosts gas pressure as high as 25 psi with a flow rate of 70 cubic feet per hour. It runs on standard 120V 15 amp power and connects to a 3/4” diameter low pressure gas pipe. Learn more about TB-60 Torch Booster. 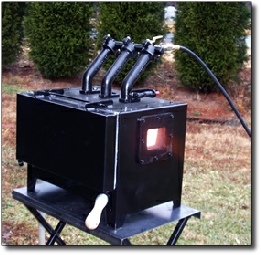 Purchase a TB-60 Torch Booster. TB-125 Torch Booster for three burner forges. TB-125 Boosts gas pressure as high as 25 psi with a flow rate of 125 cubic feet per hour. It runs on standard 120V 20 amp power and connects to a 1” diameter low pressure gas pipe. Learn more about TB-125 Torch Booster. 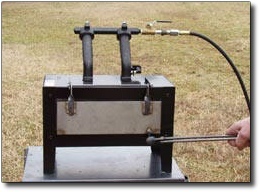 Purchase a TB-125 Torch Booster. Use your Discover, VISA, MasterCard or American Express card to purchase a G-TEC Torch Booster. New York State sales tax, if applicable, and shipping are an additional cost. G-TEC Torch Boosters are Certified by CSA International in the United States and Canada for safety reliability and performance and are welcomed in all buildings in the US and Canada, even places where cylinders of propane are prohibited. 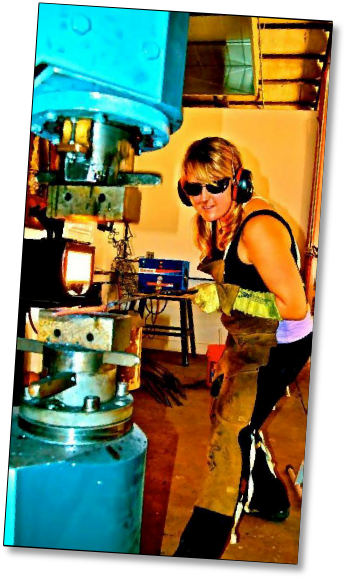 Jodie Bliss (photo right) is a metalworking artist in Monument, CO and has used a G-TEC TB-125 Torch Booster with her 3 burner NC Tool Forge for more than 4 years. I love the G-TEC and recommend it to everyone. She's been running strong for four years now with hardly any problems! Love my G-TEC!